This Museum of Art is set in Salo, at Lake Garda, and it was founded in 1983. The museum displays an impressive collection of paintings by Italian artists. Grotte di Catullo are the ruins of a grand Roman Villa. The museum exhibits information about the life of the Latin poet Catullus. In Sirmione, the name of the poet is called forth by yet another landmark, namely, a statue. The most important Roman ruins in North Italy are located in Sirmione. The Roman edifices were built in the first century AD, and today their ruins can still be seen. Another important tourist attraction here refers to the thermal baths and spas which were founded, they too, in the Roman era. Nowadays, they are a destination for thousands of tourists who come coming from all over the world in order to ease sundry conditions. Though not as important at the ruins in Sirmione, the old town of Desenzano is worth mentioning, given its historical background. It was built in the 3rd century and it attracts a large flow of visitors and tourists from Lake Garda. At Desenzano, one can see the best preserved mosaics in the world. There are many castles and fortresses along the shore of Lake Garda, and the most imposing of all refers to Rocca Scaligera of Sirmione. The access to this attraction is quite peculiar, being made by means of a bridge which must be crossed. After crossing the bridge, tourists must get trough the old city walls. 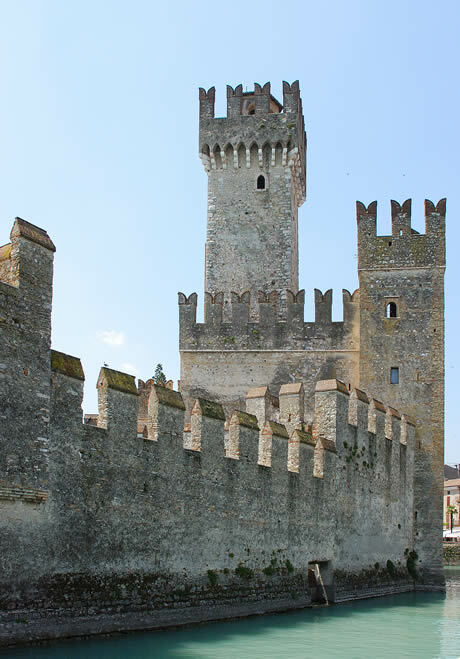 Other castles almost perfectly preserved until today are the ones in Torri del Benaco, Malcesine, Peschiera and Desenzano.